Remember your last pap smear? Yeah, we remember ours too. Even the best gyn exam involves a lot of waiting, awkwardness, a quick chat and those awful stirrups. The worst gyn exams sometimes keep us away for years. We want to transform what is possible with well care in RVA so that your first or fifteenth pap smear is safe, inclusive, painless, and empowering. We offer pap smears and other reproductive health services for people who are not pregnant. We are trauma informed, evidence based and we do not use stirrups. We do use patience, time, a massage table with regular pillows and big sheets or a blanket for exams and a couch for chatting. We have coffee and tea, and we we will listen. 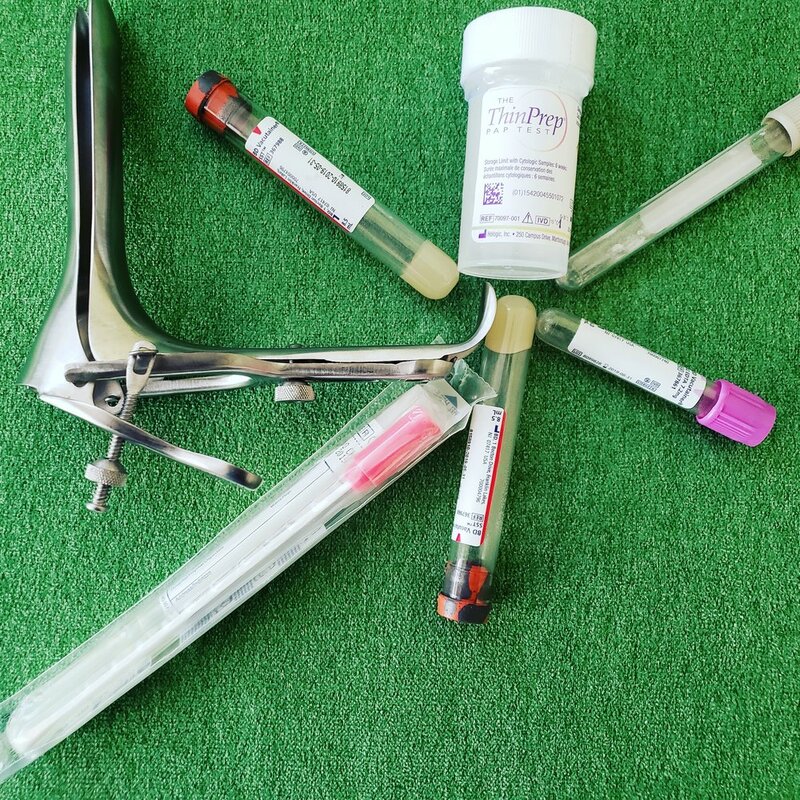 Whether you need an HIV test, a PAP smear or a fertility consultation, we are here for you. We want you to be healthy and feel safe, supported and heard. We support everyone, but we have have extra heart for our clients who have experienced trauma, including medical trauma. We are also size friendly and LGBTQIA informed and friendly providers. Contact us to schedule an appointment! We have one or two well person clinic days a month. CNM Erin Parish-Gibson is a skilled and experienced Certified Nurse Midwife working in women’s health, pregnancy, birth and beyond. She offers comfortable, empowering exams and consults for everyone. She is kind, warm and non-judgmental and happy to talk IUDs, natural family planning, STI testing, sexual assault, hormone issues, LGBTQ fertility and everything in between. Adrianna Ross, a certified herbalist and member of the American Herbalist Guild, is an experienced and passionate herbalist. Owner of Totem Herbal, she values listening, and offers individualized remedies, often mixed at the time of the appointment, from herbs she has wildcrafted and tinctured or dried herself. If you need holistic or complementary support in your health journey. She is grounded in science and is comfortable in a variety of modalities. Our Well Person pricing is pretty simple. A one hour visit with Erin and another midwife (depending on what approach you need) is 135.00. A 30 minute appointment with just Erin, for a quick pap or annual well-visit/consult is 85.00. Labs, IUD and implants are billed directly to your insurance. For people who do not have insurance, we offer labwork at cost. Contact us for most specifics about IUI/ICI consults. We also host an annual event, every October, where a quick consult with Erin and a pap is only 35.00. If you need help, and cannot afford this fee, please contact us. We will try to help and if we can’t we will help you find someone who can.